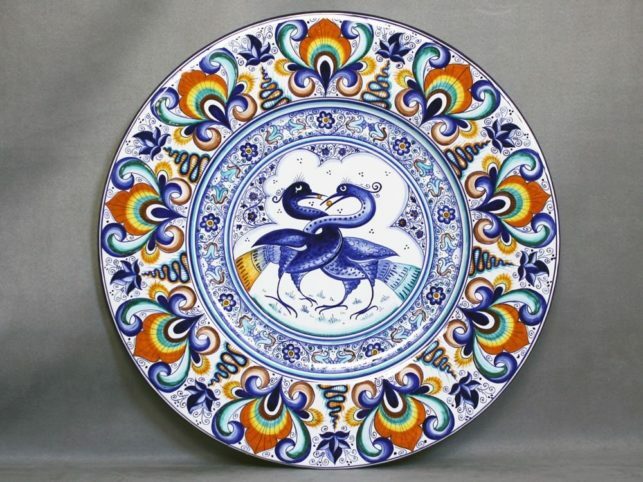 We have chosen to accompany the design of the birds – we call them “astorre”, a characteristic figure of Faenza majolica – with Pavona (peahen) style not only for the affinity of the colors, but also because the symbolism of Pavona is very similar to that of astorre intertwined: the interweaving of animals represent the flow of divine energy in the forms, growth, continuity, life, just like the peacock’s tail. This symbolism makes these pieces ideal gifts for happy recurrences such as weddings and anniversaries. Only recently, thanks to the internet, we managed to trace the vase kept at the Victoria and Albert Museum and we could also admire the back, as we had not seen it at the museum, discovering that there is a handshake with the inscription FIDESONIA which stands for fides omnia (in our version the writing becomes fides omia with the n that remains hidden in the cartouche). 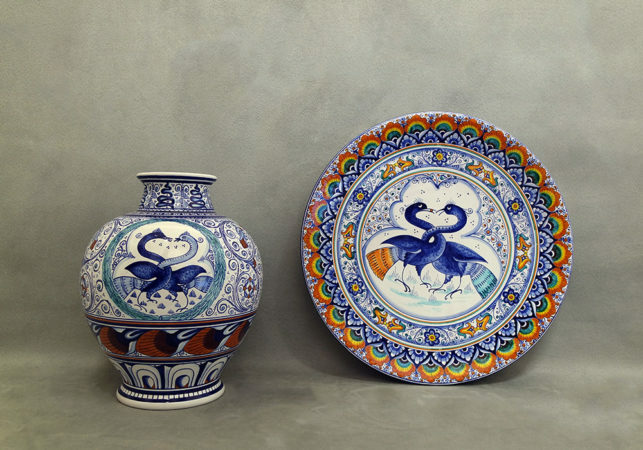 Order ceramics with this decoration, even customized! It is possible to order a piece like this, of the desired size, requiring the personalization of the writing with, for example, a person’s name. In the same way plates of various sizes are available with different decorations: the 41.5 cm plate is on sale in our e-commerce, it is possible to order customized variations by contacting us. 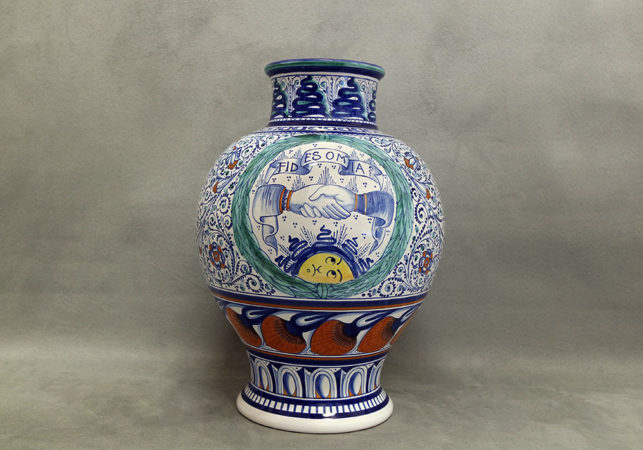 In the picture: large 61 cm diameter plate with Pavona decoration and astorre intertwined in the center.